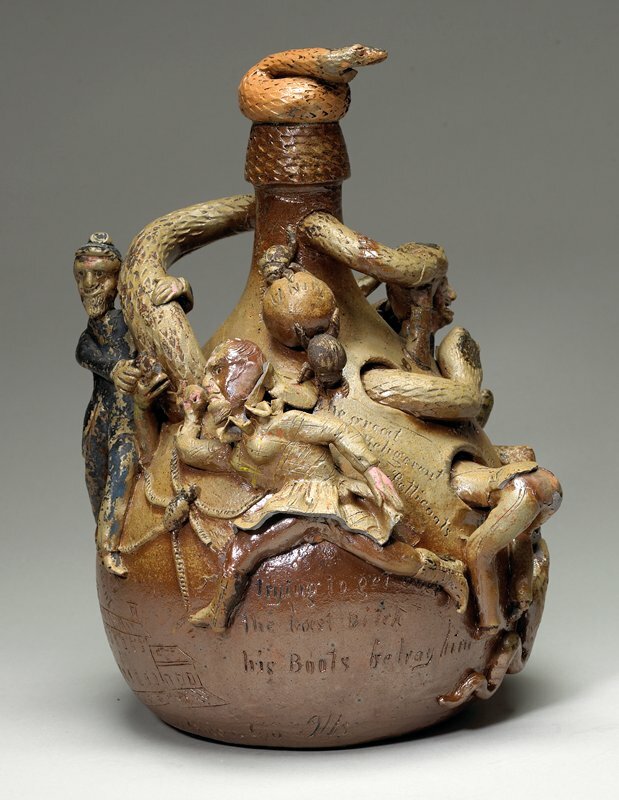 Cornwall and Wallace Kirkpatrick, brothers who owned the Anna Pottery in Anna, Illinois, made a name for themselves with their bizarre wares, especially jugs with realistic writhing snakes. Here, a scene from the Civil War (1861–65) shows Union soldiers attempting to catch Jefferson Davis, president of the Confederacy, who flees them disguised as a woman. The dark spots on the snakes’ heads identify them as copperheads—a moniker for Northerners sympathetic to the Confederate cause. The Kirkpatricks pulled these and other characters straight out of the caustic but hilarious cartoons published in Northern-leaning newspapers, expressing their own opinions in pottery that was pertinent to current politics.